From where I sit in my study I can see many pictures. There’s one of an old F-16 with a Colts horseshoe painted on its tail taking its final flight. It was flying over Lucas Oil Stadium. The picture was given to me by the pilot and snapped by his wingman just a few yards away. There is a panoramic of a kickoff at Notre Dame Stadium. I saw it at a memorabilia store years ago. When I got closer I noticed that Notre Dame was playing Michigan. The electric atmosphere almost jumped out of the frame. With an even closer look, I noticed that Notre Dame was kicking off. Closer, I realized that it was me kicking off. That seemed really cool but I wasn’t about to buy a piece of sports memorabilia. It’s just not me. A few weeks later my father-in-law surprised me with it. It’s been on my wall ever since. There’s a picture of the Super Bowl celebration. There’s another with my Colts teammates and I standing on the steps of the White House with the President of the United States. There’s even a Redskins team picture. In many of the pictures are faces. Faces of men I played with early in my career long removed from the game of football. Men whose lives have been tragic tales told over time. It is only when you look deep into these photographs that you see the tragedies and their roots. They were affected by the jersey occasionally for better, but largely for worse. 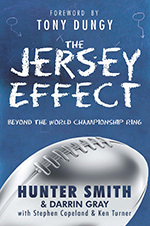 When my friend Darrin Gray and I chose to write “The Jersey Effect” I picked some of my teammates to tell their story. All of them are good friends of mine that I trust implicitly. To put it bluntly, these guys are the “real deal.” They are my brothers. Their transparency and willingness to open up about their struggles may shock you. But because of their honesty and vulnerability, this book has the potential to strengthen your faith, redefine your worldview, help you recognize the destructive ways of the jersey and potential for influence, and put this life and sports in proper perspective. The stories in this book create a picture. It is a picture of what to do and what not to do as an athlete and person. Who to trust and who not to trust. What to believe and what not to believe. I chose the men I did, not because they were perfect. I chose them because they have a proper perspective on athletics and this world amongst a generation of upside down priorities. It is mine and Darrin’s hope that as you read these pages, you are challenged, stretched, realigned, and yes, even entertained. Whether you’re an athlete or not, our allegorical jerseys will affect our lives—for worse or for better. What will your jersey effect be? What is your jersey effect right now?